This exquisite Pentagram with Crescent Moon Ornament is handcast and hand-finished in solid American Pewter with a shiny finish resembling antiqued sterling silver. This unique Holiday Ornament comes with a Red Satin Ribbon ready to hang from your Christmas Tree or as a Holiday Decoration for your home. They also make terrific gifts...you and your loved ones can enjoy this lovely keepsake for years to come! A Pentagram is the shape of a five-pointed star which comes from the Greek word meaning five lines. Pentagrams were used symbolically in ancient Greece, Christians once more commonly used the pentagram to represent the five wounds of Jesus and it also has associations within Freemasonry. The Pentagram has magical associations, and many people who practice neopagan faiths wear jewelry incorporating the symbol. 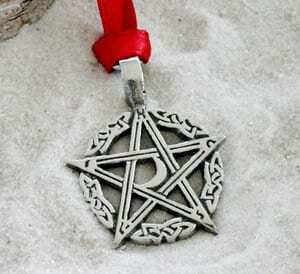 It is often used as a Pentacle which is an Amulet used in magical evocation…generally made of parchment, paper or metal…on which the symbol of a spirit or energy being evoked is drawn.